We see the return of another Aeroplan conversion bonus! Last seen in Spring, the hotel only transfer bonus is back and this time it's back up to the 30% level which is still lower than the flat 35% seen in July 2017. You have the make sure that you transfer enough hotel points to earn 5,000 Aeroplan Miles to get the 30% bonus. You'll have until August 20 to make any transfers and the 5,000 miles can be cumulative from multiple hotel programs - this is a good way to use up some of those orphaned hotel points you may never use if you are a frequent Aeroplan redeemer. Most of Aeroplan's hotel partners are participating in the promotion so you can convert from any of the following to add to your final tally. You'll notice IHG Rewards Club returns as a conversion partner. Many moons ago you could convert IHG Rewards Club points to Aeroplan but that was nixed when the IHG Rewards Club Mastercards were launched by Capital One here in Canada. Now that those cards are longer around, Aeroplan has renegotiated a new contract with IHG and the conversion option has returned! You'll also notice that the best transfer option from past promotions, Marriott & SPG are not included this time so this promotion really only makes sense if you have points sitting in other hotel programs that you may never use or are about to expire so that you actually get some value out of them! Hotel partner loyalty programs eligible for this promotion are: IHG Rewards Club, Best Western Rewards, Choice Privileges, Coast Rewards, Radisson Rewards, Hilton Honors, Le Club Accorhotels (Accor hotels), Golden Circle Award (Shangri‑La), Wyndham Rewards. 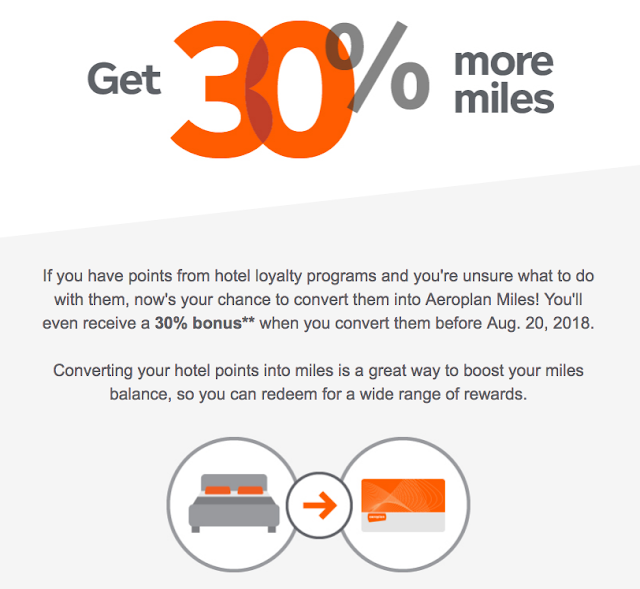 The total amount of miles received from the conversion of hotel loyalty program points into Aeroplan miles must be greater than or equal to 5,000 Aeroplan Miles in order to be eligible to receive the 30% bonus.